In November, the Grand Canyon’s North Rim turns to Day Use Only. As such, the lodge and campgrounds inside the park are closed. In addition, services are unavailable. The only thing open is the gift shop at the lodge. While this may sound unappealing to many vacationers, for those who wish to enjoy nature without the crowds, November is a great time to visit the North Rim. While the park as well as most of the limited merchants have closed down their services, the road remains open until November 30th or until it snows, whichever comes first. Along the way, there are two gas stations whose pumps operate, a lodge, and a RV Park that cater to the few who venture to the relatively remote area. The only lodge open, Jacob Lake Inn, is 40 miles away from the North Rim, so I camped for one night off Forest Road 611, only 18 miles from the park. There are several remote camping spots around the area. In addition, Forest Road 611 leads to the East Rim Viewpoint, a nice overlook as well as an access point to the 800 mile Arizona Trail. Camping for one night provided me the perfect amount of time for me to explore the area. I started the morning driving to the North Rim Visitor Center in hopes to find a map to better familiarize myself with the Grand Canyon’s North Rim. Fortunately, the gift shop had one available as AT&T cell service in the area is spotty. While I perused the online brochure prior to arrival, my memory isn’t eidetic. The Visitor Center is located next to the Grand Canyon Lodge at Bright Angel Point. Mid-morning I found parking easily and wandered between the Lodge cabins with hardly a soul about. I followed the short, but steep trail to Bright Angel Point that I shared with maybe five people! The 0.5-mile trail includes awesome views along the way too! I quietly enjoyed the spectacular view before I moved on to the North Kaibab area of the Grand Canyon’s North Rim. Here, I hiked the Uncle Jim Trail located at the end of the parking lot. The 4.7 Uncle Jim Trail described in the Grand Canyon’s North Rim brochure begins part of the Ken Patrick Trail. The Ken Patrick Trail undulates through sparse forest with many fallen trees. The trail connects to Uncle Jim Trail at 0.9 miles. The trail intersections are not signed so it is best to bring a map or to stay right on the way to the overlook. The Uncle Jim Trail is a lollipop loop including a 0.4 mile stem and a 2.1 mile loop. The loop trail is relatively flat and includes a wonderful overlook. The overlook offers views of the canyon as well as of the North Kaibab Trail that descends into the canyon. During the high season, mules use this trail. As such, horse hitches and even a bathroom from tourists are located at the overlook. During the low season, however, the mule operation isn’t running. Because I visited in November, I took in this view in complete solitude, with only the wind making any noise. No visitors. No Hee Haws. No manure smells or fly swatting. Just me and nature. What a treat! I didn’t even see anyone else on the trail until the final return mile when I stumbled across a group of four Asians. They wondered how much farther they had to go because the trail was “boring”. Agreed, it was a little boring without summer wildflowers. But I added no crowds, no mules, cool versus hot weather, and a view to myself to my winner’s circle. From Uncle Jim Trail, I loaded into my car and drove to Point Imperial. Located in the Northeast section of the park, Point Imperial offers lovely views from the Grand Canyon’s North Rim. The following day I watched the sunrise over the Grand Canyon. The easiest and closest place to reach in the dark is Bright Angel Point. As such, I returned to the North Rim Visitor Center and was the first car in the parking lot. Another car zoomed in behind me and three visitors jumped out and raced toward the point. Given there are three lookouts in this small area, I went to the one just south of the lodge. I’m glad I made this choice, as when I finally wandered over to Bright Angel Point, I learned from the mom that her son just proposed to his girlfriend! I would have hated to ruin that moment. Anyway, I walked out to the point as they were leaving and enjoyed the view all to myself. For at least 30 minutes, I watched the canyon walls turn from shaded to orange as the sun rose in the sky. How many people can say they watched the sunrise over the Grand Canyon all by themselves? Totally awesome!! Thank you, November. Video: Now you can watch the sunrise too! So, the only section of the Grand Canyon’s North Rim I had yet to explore was the Cape Royal area. I spent the next 45 minutes following the winding road to its end at Cape Royal and Angels Window. Boy was I surprised to see a hole in the cliff. I don’t think I’ve ever seen a picture of a rock feature with a hole in it in the Grand Canyon. I suppose that emphasizes the remoteness of the Grand Canyon’s North Rim compared to its popular South Rim. After admiring the view from Angels Window, whose name should have clued me in, I followed the path to Cape Royal. While there isn’t a “no climbing” sign, I likely broke the rules when I shimmied through the low fence for a better view. I would have behaved if anyone were around, but with the place to myself, I couldn’t help it. Trust me, I didn’t put myself in danger. I don’t like ledges, so I never got close to the edge. I could just snap much better photos of the spectacular, surrounding scenery in the large area outside the fence. 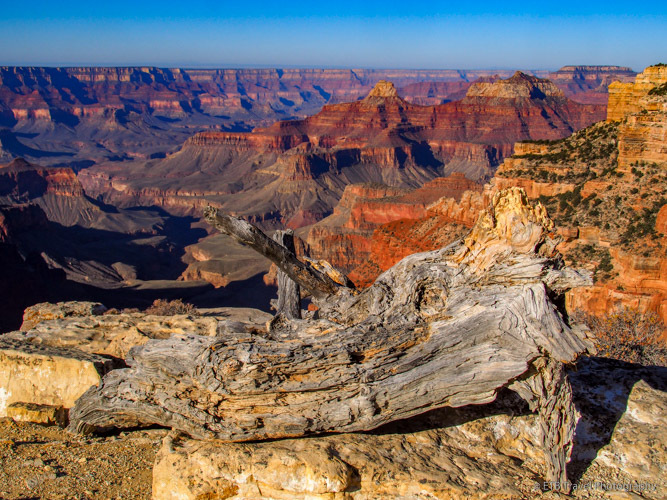 Oh what visiting the Grand Canyon’s North Rim in November affords…the grandeur and peace of nature. After admiring these overlooks, I backtracked in my car to Cape Final Trail. This trail, similar to Uncle Jim Trail, travels through the forest to an overlook. This forested area was prettier than the section on Uncle Jim Trail. The path also passed by multiple viewpoints. The final overlook is located by one remote campsite. What an awesome place to stay overnight! After enjoying the solitude and beauty once again, I soon returned to my car and headed back to Kanab, Utah for the night.